When I was offered this kit to play with I realised I had tried the No.4 smoother and been fairly complimentary about it, so it was interesting to see if this sample was to the same standard and at the same time try out the No.60 block plane, which I hadn't had a go at before. 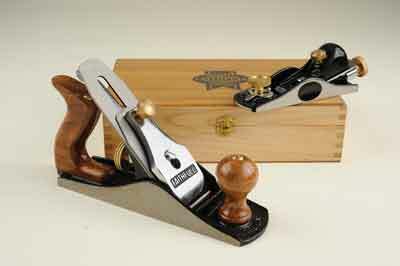 Both tools are supplied in a presentation case of average quality but it does keep them safe. 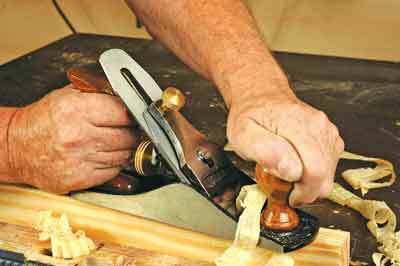 Starting with the smoothing plane it is a copy of the standard Stanley Bailey pattern which is a very tried and tested design, being approximately 150 years old since Leonard Bailey started making them. The body casting was slightly thicker on one side but otherwise well turned out with finely ground soleplate and sides. The wooden knob and handle look good and are highly lacquered. Everything you would expect to be right is; the brass knobs are good, frog adjustment is perfectly possible and the machining to rest the blade assembly on is well done. The brass screw on the front wooden knob sticks up too far and as when I reviewed the No.4, I filed it down. The general appearance and build is good. I spent 10 minutes flatting the sole as I do with any plane, then flatting the back of the blade and sharpening to a good edge on a diamond plate. The resulting edge I could tune in the plane to get a thin ribbon of shavings. Time and experience will show how good the blade metal is at edge keeping but I was impressed this time around. This is another well-trod design, again a well cast and machined tool with a low cut-angle. The blade adjustment and mouth adjustment mechanisms are well made and operate nicely. It all looks very crisp and appealing and it fits the hand nicely: thumb on front knob, fingers in body recesses and the blade cap casting comfortable in the palm. The blade has a large cutout which limits the amount of metal remaining after repeated sharpenings. The sole needed flatting like the No.4 because of slight hollowing in the grind. That done, the blade got the flatting and sharpening treatment and I got a gratifying wire edge to knock off on the bench and, although using a strop would have got a cleaner edge, the No.60 nevertheless took some end grain mahogany (Khaya ivorensis) in its stride cutting cleanly and quickly. I rather covet this little plane with its various adjustments.